#Manning sentenced to 35 years. Means he'll likely serve about 8 to 8.5 yrs more in confinement and be out by the time he's 33 or 34. Manning's lawyer David E. Coombs told reporters that Manning actually comforted the weeping defense attorneys as Lind read the verdict. "He looks to me and he says, 'It's OK. It's alright. I know you did your best. I'm going to be OK. I'm going to get through this,'" Coombs said. During a press conference after Lind handed down the sentence, Coombs read a short statement from Manning in which the whistleblower compared US policies enacted after the September 11, 2001 terrorist attacks to shameful events in the nation's history. "In our zeal to kill the enemy, we internally debated the definition of torture. 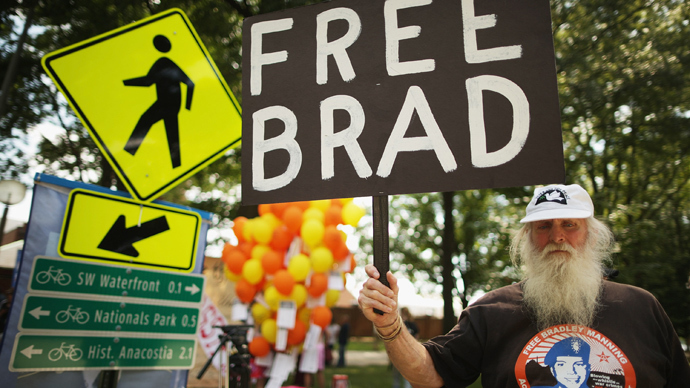 We held individuals at Guantanamo for years without due process. We inexplicably turned a blind eye to torture and executions by the Iraqi government. And we stomached countless other acts in the name of our War on Terror," he said. "Patriotism is often the cry extolled when morally questionable acts are advocated by those in power. When these cries of patriotism drown out any logically-based dissention [sic], it is usually an American soldier that is ordered to carry out some ill-conceived mission. "Our nation has had similar dark moments for the virtues of democracy—the Trail of Tears, the Dred Scott decision, McCarthyism, the Japanese-American internment camps—to name a few. I am confident that many of our actions since 9/11 will one day be viewed in a similar light," Manning's statement continued. "As the late Howard Zinn once said, ‘There is not a flag large enough to cover the shame of killing innocent people.’"
"Instead of fighting tooth and nail to lock him up for decades, the US government should turn its attention to investigating and delivering justice for the serious human rights abuses committed by its officials in the name of countering terror,” said Widney Brown, Senior Director of International Law and Policy at Amnesty International. Elizabeth Goitein, co-director of the Liberty and National Security Program at the Brennan Center for Justice, decried the sentence as "unprecedented" in its magnitude. "It's more than 17 times the next longest sentence ever served" for providing secret material to the media," said Goitein. "It is in line with sentences for paid espionage for the enemy." 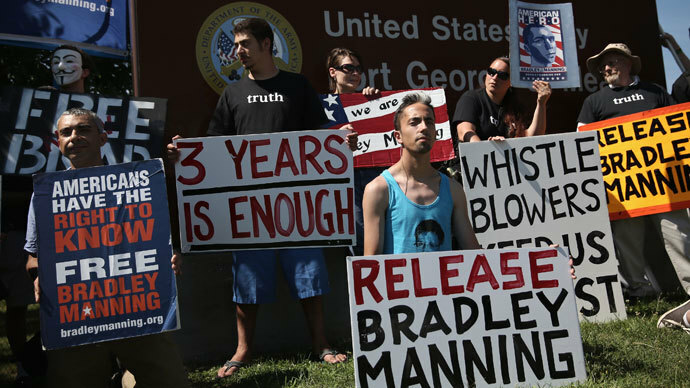 WikiLeaks, however, argues the sentence can be perceived as a victory for Manning, as it leaves open the possibility that he will be released within a decade's time or less. 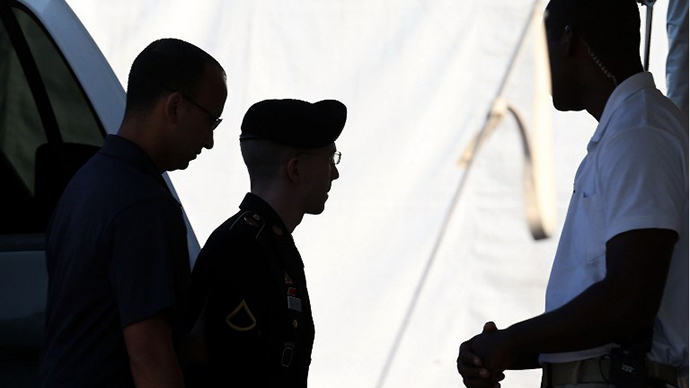 Again, under federal law, Manning must serve one-third of his sentence before he is eligible for parole and has been given credit for time already served. 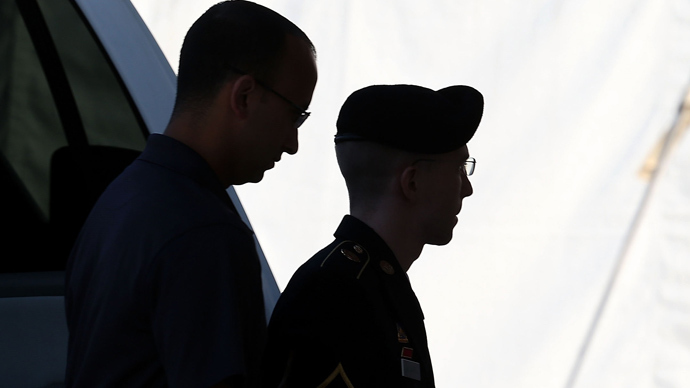 Manning's sentence will automatically be sent to the Army Court of Criminal Appeals as it exceeds a period of one year. Coombs had previously asked the judge for leniency, requesting a sentence that did not “rob him of his youth." Coombs argued that Manning's leaks had not endangered the US. "There's value in deterrence," prosecutor Capt. Joe Morrow said in his closing argument on Monday. Last week the 25-year-old Manning apologized for the “unintended consequences” of his actions, saying he believed he was “going to help people, not hurt people." 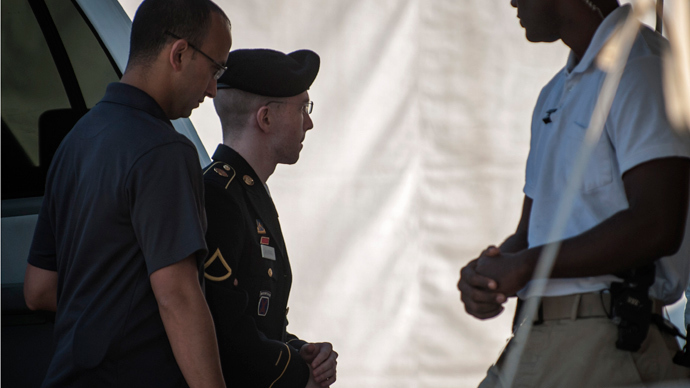 He told the court at Fort Meade, Maryland, that "the last three years have been a learning experience for me." "It's presided over by military folks," Finch told the Associated Press. "These are people who cleaned bathrooms with a toothbrush during basic training."